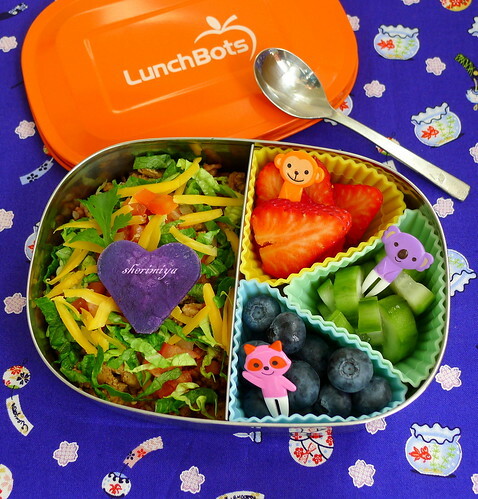 Tacorice LunchBot Bento, a photo by sherimiya ♥ on Flickr. Today's tacorice isn't packed in a bowl for once; I thought I'd change it up, and the LunchBots Duo fits the bill perfectly. One side holds red and white rice topped with taco meat, chopped tomatoes and lettuce, grated cheese and a steamed Okinawan sweet potato heart shape. Other side is divided by silicone cups for: strawberries, pickled cucumbers, and blueberries. We ate this at dinner with tableside guacamole and tortilla chips. Yum! I love the way you used silicone dividers in this bento! Very geometric and fun! I need to try taco rice, I always get stumped on how to put taco leftovers into bento, this is a great way to do it! Oh man, I think I prefer tacorice over regular tacos. Heh. Thanks Michelle! This is exactly the kind of combo I love! Rice with veggies, topped with cheese.. oh man. So awesome! So sweet. Thank you Chantale!